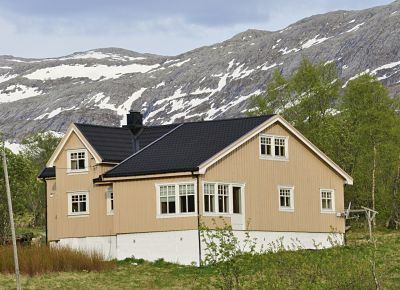 Nice house for sale in North-Norway. 5 bedrooms. Very nice naure. Big mountains, rivers and sea. The house is in Leirford, region nordland. Leirfjord is a village between 2 citys called Sandnessj�en and Mosj�en. The city Mosj�en, is the town who is 100% in the middle of Norway. Leirfjord is located on the Helgeland coast in Northland country. Here is a very nice nature for fishing and skiing. Big beautiful mountains, rivers and sea. Here are also two fine cities. The house is only five minutes from downtown and you can allso drive to the oil city Sandnessj�en in 15 minutes and Mosjoen town in 40 minutes. The house is very nice. It is a fantastic view from the house, and the building was made in 2005, it�s about 200 m2. The lot is about 6500 m2. is quite big. I have all papers you need for the lot and the house. Description: Detached, can see the house from the road. The lot is 6500 m2. If you`re interested, I can send you more pictures.